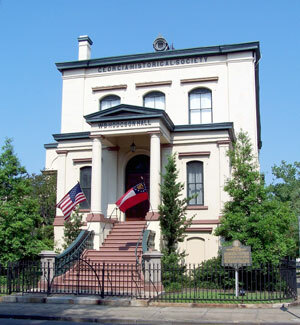 Chartered by the Georgia General Assembly in 1839, the Georgia Historical Society is the oldest continuously operated historical society in the South. As an educational and research institution, GHS teaches Georgia history through a variety of educational programs, scholarly publications, and research services. It publishes the award-winning Georgia Historical Quarterly (Georgia’s journal of record since 1917), maintains a library and archives, manages the Historical Marker Program for the State of Georgia, produces the daily television and radio program Today in Georgia History (in partnership with Georgia Public Broadcasting), and organizes the annual K-12 education program Georgia History Festival. Headquartered in Savannah with an office in Atlanta, GHS has over 6,000 members and nearly 200 affiliates in 80 counties. Visit the Georgia Historical Society website.